How do the precarious conditions of academic labor affect the conversations that are possible in the academy? How does academic freedom protect—or fail to protect—academics from doing politicized work? How do questions of Palestine in particular affect our understandings of academic labor and academic freedom—and vice versa? 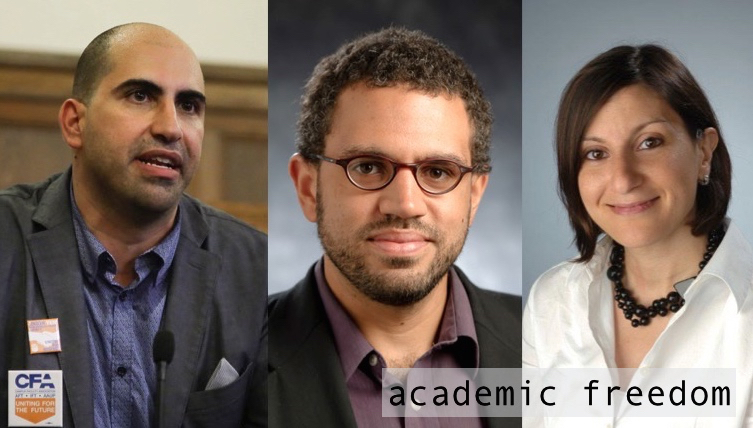 In episode 26, Steven Salaita, who lost a tenured job offer after writing a series of tweets condemning Israel’s “Operation Protective Edge,” talks about the rhetorical commonplaces of civility in the academy, and the stakes of circulating critiques of state power on various media platforms. Assistant professor of religion Vincent Lloyd, and associate professor of English Carol Fadda-Conrey—who helped to organize a talk by Salaita on SU’s campus this fall—reflect on their academic trajectories and political work, offer suggestions for how young scholars can build networks of support, and remind us to realize the critical potential of our discipline. The music sampled in this podcast is akaUNO’s “Hidden Leaves,” and “Another Word” by The Left Curve. We want to enact social justice in our classrooms. We try to do this by considering diverse student bodies, incorporating multimodality into our classrooms, developing equitable assessment, and so much more. What about participation and democracy? Even if we value participation and democracy in our classes, what do these concepts look like in reality? And what about the pesky problem of authority? What about the unequal power relations between teacher and student? 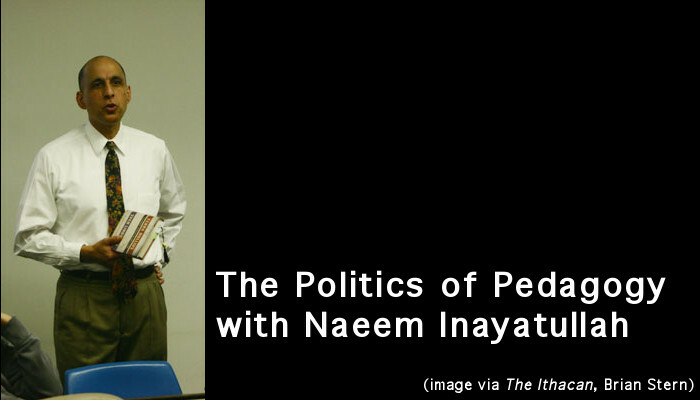 Episode 15 features an interview with Naeem Inayatullah, Professor and Chair of the Department of Politics at Ithaca College, who describes his pedagogical approach in the classroom: an approach he describes as Socratic, collective improvisation. This approach is at once radical and reflexive, informed by Lacan and addressing the power inequalities that exist in the classroom. The music sampled in this podcast is “Budgerigar Vishnu” by Vinod Prassana. 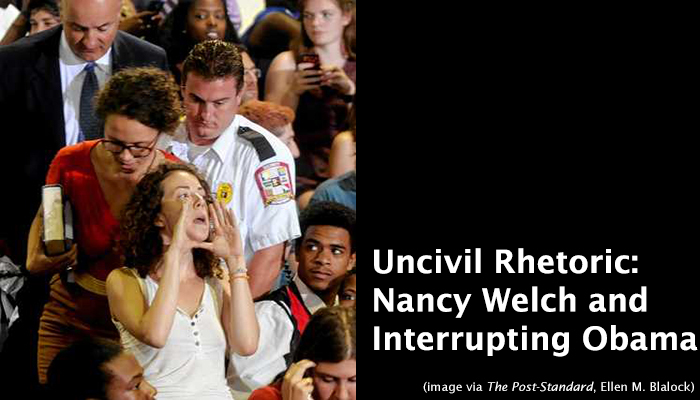 Amelia Ramsey-Lefevre shouts through cupped hands as she and Ursula Rozum are escorted out of Obama’s speech in Syracuse, August 22nd. Episode 13 is a two-part episode that features an interview with Nancy Welch discussing the motivation for her scholarly work, composition’s activist roots, and the importance of participating in activist collaborations once tenured. The second part features an interview with Ursula Rozum and Amelia Ramsey-Lefevre who interrupted President Obama’s speech at Henninger High School on August 22, 2013 in order to ask Obama to pardon Private Manning through nonviolent free speech action. This podcast blends activism in both academic and public contexts, highlighting the ways that particular rhetorical acts are treated as un/civil. The music sampled in this podcast is “Biomythos” by Revolution Void, “Indyair” by Springtide, “Note Drop” by Broke for Free, and “Subterranean Zerbie” by The Mork Quartet. 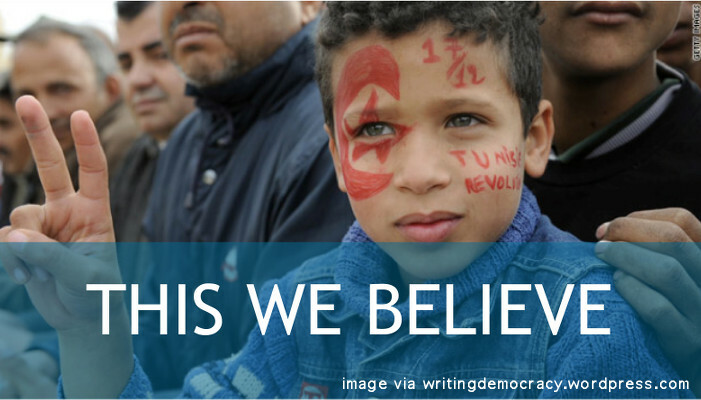 Episode 12 is a glimpse into This We Believe, a project from Writing Democracy to record and archive conversations about democracy. This podcast features brief narratives from Cindy Selfe, Paul Feigenbaum, Steve Lamos, and Ellen Cushman who talk about democracy in our classrooms and in the world, in theory and in practice, and through linguistic and social action. The music sampled in this podcast is “As Colorful as Ever,” “Murmur,” and “Note Drop” by Broke for Free and “Namer” by High Places.